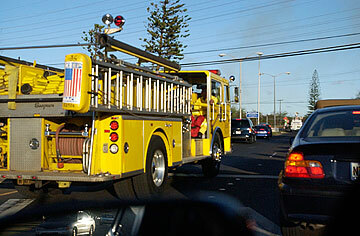 Engine #36 from Mililani races through traffic along Fort Barrette Road on its way to a fire. Motorists should identify where a siren is coming from before driving through intersections. Question: I would like to know what the Honolulu Fire Department's protocol is when responding to a call with their lights and sirens on, but approaching a red light. If I'm not mistaken, even though they are emergency vehicles, they must also come to a complete stop and make eye contact with all drivers before they can proceed through the intersection safely. I figured that they would have learned after a fire truck struck a car in a Makiki intersection in 1998, killing the woman driver. At about 10 p.m. July 27, I was sitting at the red stop light at the intersection of South King and Isenberg streets, heading toward Kahala. In the background I could hear sirens blaring, but could not see where it was coming from. When my light turned green, I started to proceed on South King, when a fire truck came blazing through the intersection, up Isenberg, honking its horns and sounding its sirens. I had to step on my brakes or it would have come close to clipping my truck. Aren't they supposed to stop for a red light even with lights and sirens on instead of jeopardizing peoples lives? Besides finding out what the HFD's operating procedure is on something like this, please make them aware that just because their drivers have bigger vehicles they just can't push through the intersection. Answer: Authorized emergency response vehicles are allowed to proceed past a red light or stop sign, but only after slowing down or stopping as necessary for safety, said HFD spokesman Capt. Terry Seelig. They are not necessarily required to make a full stop and there is nothing said about making eye contact in either the Hawaii Revised Statutes or Revised Ordinances of Honolulu, which address emergency vehicles responding to calls. But safety is the overriding factor when fire vehicles approach an intersection, Seelig emphasized. He said HFD trains its drivers on responding to emergencies safely and with "due care" for the safety of everyone, which goes beyond what the law allows in terms of "rolling" stops. Because the streets are often congested and people may have a difficult time hearing sirens or recognizing an emergency vehicle, HFD "trains its drivers to stop at intersections when the red light is against their path of travel and proceed through only when other vehicles have stopped and given the right of way," Seelig said. Making eye contact is one way to make sure that it's safe to proceed, but it's not practical or possible to make eye contact with every driver on the road, he noted. "Obviously, speed is of the essence when responding to an emergency, but never at the expense of anyone's safety," he said. To help emergency vehicles respond safely, drivers, for their part, are asked to remain stopped at an intersection when they hear a siren until they determine the location of the emergency vehicle. "Drivers can then decide where to move to help the emergency vehicle continue its response," Seelig said. In your case, he said, remaining stopped until you determined that the fire truck was coming up Isenberg Street would have led you to not enter the intersection until it had passed. "In all cases," HFD reminds drivers not to cross an intersection on a red light, even if an emergency vehicle is behind you using its lights and sirens, he said. Section 291C-26 of the Hawaii Revised Statutes says drivers of emergency vehicles responding to a call may, among other things, "proceed past a red or stop signal or stop sign, but only after slowing down as may be necessary for safe operation;" exceed maximum speed limits as long as doing so does not endanger life or property; disregard regulations on the direction of traffic movement or turning; and drive on the shoulder and median of roadways. If they do any of the above, emergency vehicles must make "use of authorized audible and visual signals." The exception to this are police vehicles. That all said, "The foregoing provisions shall not relieve the driver of an authorized emergency vehicle from the duty to drive with due regard for the safety of all persons, nor shall those provisions protect the driver from the consequences of the driver's reckless disregard for the safety of others." Sec. 15-4.4 of the Revised Ordinances of Honolulu basically has the same provisions. Regarding the use of signals, however, the city ordinance says authorized emergency vehicles are allowed to ignore the usual traffic regulations only if the driver "sounds a siren, bell or exhaust whistle as may be reasonably necessary, and the vehicle displays a lighted red lamp, or in the case of the Honolulu police deparstment only, a lighted blue lamp, visible under normal atmospheric conditions from a distance of 500 feet to the front of such vehicle as a warning to others."